Can There Be a Problem with My New Roof on My New Home? You are here: Home » » For the Buyer » Can There Be a Problem with My New Roof on My New Home? You would not expect to find a problem with a newly built home; however, there will be issues. One common place to find something wrong will be on your new roof. One statement that I hear consistently from homeowners that are buying a new construction home is that there will not be any problems, because the home is newly built. I have had builders tell me that my clients are wasting their money by hiring me. They have told my clients that fact as well. There is some truth in this statement. Builders do try to ensure that a quality home is built. There are city inspectors and maybe county inspectors examining new construction. I do notice parts of the home that I would do differently, and I do notice parts that should not have been built or left that way. I guess no inspector can catch everything. One area where small issues that could lead to big problems happen with more frequency appears to be the roof. You would not expect a problem with a new roof on a new home, but the style of roof may cause construction methods which lead to problems. I am standing comfortably on a section of roof studying the steep incline of a gable end, pondering if I could safely ascend to the next level of the roof. People have laughed at my antics of running and jumping along roof surfaces, so I can reach another roof surface to examine a roof installation. I have placed my self in danger on more than a few occasions. When the pitch of a roof goes over 45 degrees in inclination, you cannot easily climb that surface. This is when I look for signs as to how the roofing contractors may have been getting up. The best method is when they install a roofing jack. This is a metal brace that attaches to the surface of the roof. Two of these braces will hold a piece of lumber that becomes a landing. A few of these landings along a steeply pitched roof allows for access to the higher roof sections. Another method is nailing the piece of lumber directly on the surface of the shingles. Both methods cause holes in the shingles, and these holes could be through an exposed surface. When the brace or lumber is removed, you have a hole. A hole that could be a source of a leak. 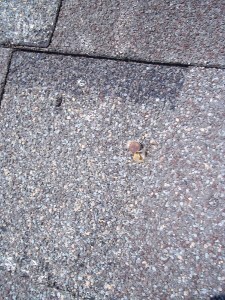 The picture shows the nail and hole that can be left behind by the roofers. You will notice that a dab of caulk was placed on the nail, but the nail is sticking up, and the caulk does not fully cover the surface of the nail. This little problems can lead to the bigger issue of water damage later. A steeply pitched roof has an advantage in our climate. Rain water will roll down this surface faster, which means the shingles experience less damage due to the water. We may be in a drought in Houston, but we do have heavy rain storms and hurricanes, so these roofs do help shed that water. There is another good aspect to these highly pitched roofs: more attic space. The heat inside the attic rises to the top, keeping the area near the living space slightly cooler. Every little bit helps. If these steeply pitched roofs shed water faster, why would you need to worry about water damage? As the water is running down the roof, the divot created by removing the nail catches water, which seeps into the sheathing below. The most commonly used sheathing under a roof is OSB. Great stuff as long as it does not get wet, where the laminate comes apart with moisture. A rusting nail also helps this moisture process, like the hole does. For this reason you want these holes and nails caulked. Are you buying a newly built home? Your builder may tell you that you do not need a home inspection. One argument against the home inspection is that if you do find a problem with the house, you can have it repaired under the warranty. True. Some problems may never be found until it is too late. The warranty may have run out, or you are stuck with a problem until the builder or warranty company comes around for the repair. I think that you a better served by having the repairs done before you move in. You have some power over them before closing. This entry was posted on Monday, April 25th, 2011 at 2:30 pm	and is filed under For the Buyer. You can follow any responses to this entry through the RSS 2.0 feed.